Are you facing chemotherapy for the first time soon, or do you care about someone who is? Are you (or are they) feeling afraid? Are you wondering what to expect on that first infusion day? 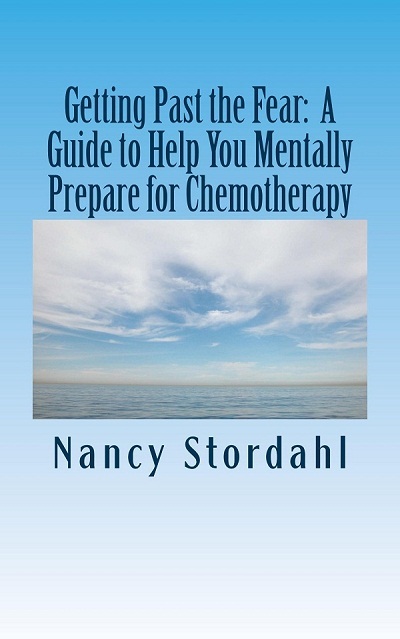 If so, reading this excerpt from my book, Getting Past the Fear: A Guide to Help You Mentally Prepare for Chemotherapy, just might help. When the day arrives marking the beginning of your chemo campaign, expect to feel many emotions, the greatest one more than likely being fear mixed with plenty of dread. I remember that day well. I was terrified, but at the same time surprisingly, outwardly quite calm. It wasn’t possible for her, or anyone, to completely understand how fearful I was actually feeling. If truth be told, I felt like leaping out of the brown fake-leather recliner I had carefully chosen and running out the door as fast as possible. Again, this is why I wanted to write this book, to help alleviate some of your fear. If you know what to expect, at least somewhat, hopefully some of the fear can be tamped down a bit. Sometimes getting rid of even a little bit of fear makes a difference. Before you begin chemo, your doctor may or may not recommend a port. If you have a choice in the matter, in my opinion, a port is the way to go once you get over the shock of needing such a God–awful thing. Generally, a port is surgically inserted on a day before chemo starts. It’s a fairly minor procedure, but many like to get it out of the way early. My surgeon wanted to put my port in place a week or more before chemo started, but I bawled like a baby when he told me this because my husband and I had our getaway planned and the thought of going on our mini-vacation with a port in, caused me considerable distress. Go figure. I guess this was one of my breaking points. My tears and pleading quickly changed the surgeon’s mind and my port was surgically put in place on the same day as my first chemo infusion. That worked out fine for me. Who said tears can’t get you what you want? Just kidding. You might find it helpful to have your partner, another loved one or a friend accompany you, especially for your first chemo infusion. Others prefer to go it alone. Decide before the day arrives. Certain drugs may make you too sleepy to drive safely, so find out beforehand if you’ll even be allowed to drive home. It’s usually a good idea to eat something before your infusion if you can, although they usually have soup, crackers, juice and the like available, so don’t worry if you can’t eat beforehand. Don’t expect to sleep much the night before. Also, chemo takes several hours, so be sure to wear comfortable clothing. You will check in with the receptionist like usual at your cancer center. Your weight will be recorded, as it will be closely monitored for fluctuations throughout chemotherapy. You will have an appointment with your oncologist either before or after your infusion to go over things and to have a quick physical exam. You will have blood taken to check and subsequently monitor your red and white blood cells, as well as other markers. If you have a port, blood can be drawn through that. I always liked to receive a copy of my blood work report. If you want one, ask for it. You will meet the chemo nurse who will be responsible for your infusion. He or she will double check your name and birthdate and help you get comfortable. Some cancer centers allow you to choose between a private room or a group setting. In a group setting, depending upon how busy your facility is, there may be just a couple of others receiving chemo or a dozen or more. If you’re put in a large group setting, there may be little privacy. This can vary quite a lot. Think about which you might prefer if you do get a choice. Be sure to ask about available options. You may very likely receive anti-nausea or pre-chemotherapy drugs first through an IV, again via your port if you have one. This usually takes about half an hour. In addition, you may also be given fluids to help drugs work more effectively and to keep you hydrated. Don’t be afraid to drink fluids as well. Don’t worry about bathroom breaks. You can easily use the restroom during infusions. Dragging the IV along with you is no big deal. Just be sure to ask the nurse the first time what you can and cannot disconnect. The infusion of your prescribed chemotherapy drug(s) will then begin. The process may take several hours to complete, so be sure to bring reading material or music to listen to. Some people sleep or watch TV. I could never do either. When the infusion is complete, your IV will be removed and your vitals may be checked again. Your oncology nurse should go over any possible side effects to expect and give you a chance to ask questions. If you have any, be sure to ask. You may receive prescriptions for anti-nausea drugs to take at home for a day or two. It’s even better if you get these filled before your first chemo day. Be sure to fill all prescriptions and start taking medication(s) as directed before you feel ill. You want to stay ahead of the game and prevent side effects from developing if at all possible. Next time should be a little easier. Now go home and try to get some rest, chemo is exhausting both physically and mentally. Knowing what to expect on chemo day can help you feel more relaxed. Find out what you can expect. Stay tuned. My next post will be offering a giveaway of my book! Are you facing chemo soon, or do you care about someone who is? If you’ve had chemo, what did I miss? 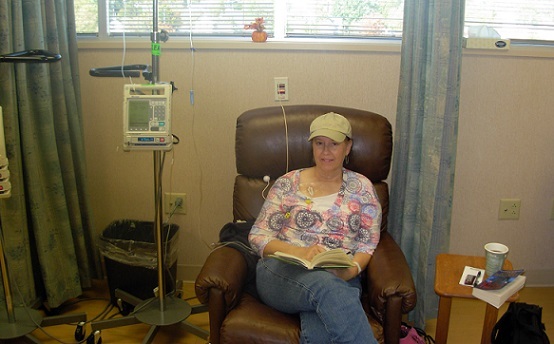 This is one of very few photos taken of me during chemo. If my smile looks forced, that’s because it was. For more information about Getting Past the Fear, click on the image. You know I love your book, and your advice is solid. I can’t think of anything else, except maybe bring a portable DVD player and earphones so you can watch a movie(s) if you want. The picture of you receiving chemo is very telling, and it makes me sad. Sometimes I wonder why I didn’t have a picture of me taking chemo or my real breasts before my bilateral mastectomy. I remember my first chemo so clearly. I was so very frightened during the days leading up to it, but the day of, for some reason, I felt positive energy. I couldn’t understand why I had no fear on the day of, but I think it was a defense mechanism. I think I talked myself into cheerfulness so I could walk into the chemo room and not run away. After I got sick after the first infusion, I never went to chemo cheerful again. Beth, Chemo is so frightening. I think you’re right about that defense mechanism. I know I was pretty calm on the outside and tried to fake my positivity. The fear and apprehension can’t be avoided, but I do wish it was addressed a bit more. Sorry to hear you got sick after your first infusion. Chemo is awful, but somehow we get through it. Thank you for sharing and for the tip too. This is a great article. I was so worried about chemo because my Mother’s experience had a profound impact on me. Once I got it into my head that I am not my mother it was much easier. I’m not sure if they do this where you are but here in the UK some chemo’s are given by “push” instead of infusion. It means a nurse has to sit with you with a syringe full of chemo drugs and slowly push it in through a canula. Canulation became quite tricky for me so one of the things I’d suggest, if available, is getting a port. They didn’t use them in my hospital but it would have made things much easier for me and the chemo nurses. Tracy, I was thinking about my mother’s experience as well which only added to my fear too. Not everyone gets a port here either. Each person and situation is different. I agree that a port can make infusions easier. I was really ‘glad’ I had mine. Thank you for reading and sharing. Mandi, Good snack ideas. Thank you. 1. Drinking plenty of water, including the day before chemo. It helps flush the toxins out and helps with some side effects like constipation. 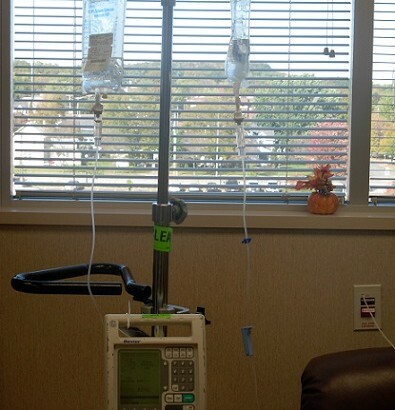 I drank at least 10 glasses of water/day, more on infusion days, because chemo can be very dehydrating. 4. Eating healthy food and exercising have helped me tremendously. (Even taking brief walks throughout the house on infusion day helped. Movement, small bites of food, and small sips of water helped combat nausea.) They boost my immune system and the endorphins from exercise are great for my mood and help fight fatigue. That said, I take naps when I feel the need. I listen to my body and cut myself a lot of slack. I also focus on doing what I love as much as possible and on living in the moment. I was plenty nervous before my first infusion — visiting the chemo bay isn’t the same thing as actually sitting in the chair. But after the first time I knew the drill and I also knew how my body reacted. My cancer center gave me a chemo teaching sheet with advice on how to deal with various side effects. Since I had no idea what to expect, I prepared for as much as I could with OTC remedies. I also made sure I had various types of food in the house, since I didn’t know what my appetite would be like. Putting lemon juice in my water helped with metallic chemo mouth. Prune juice helped relieve constipation. Ginger tea helped relieve nausea. These days they give pre-chemo meds that really help decrease side effects. Don’t be afraid to ask questions of your team and let them know about any discomfort. (As my oncologist’s assistant told me, “People are afraid they’re seen as complaining, but they’re not.”) Chemo nurses have seen everything and are terrific. If you get a port, I recommend also getting a port pillow to attach to a seatbelt. 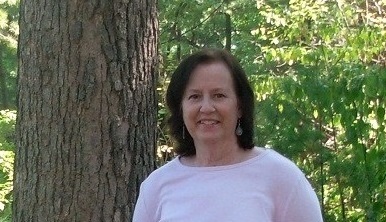 I also wore button-front shirts on chemo day so that my port could be accessed more easily. Elissa, Great advice. My favorite sentence in your list is “People are afraid they’re seen as complaining, but they’re not.” Yep, so true and not just in regard to chemo. Thank you for sharing your helpful list. And I agree about the port pillow. I worried about that seat belt. I still worry about it with my implants. I will never forget the first day of chemo. That was the day I convinced myself I should write fiction – my imagination ran wild. Everyone reacts so differently to chemo but based on my experience, I would highly suggest eating very small portions of foods more frequently, starting two days prior to the treatment. Because…constipation was the WORST side effect for me. Also, eating small portions of food more frequently will help with nausea. Nancy, you just reminded me of an experience I had with AC which I’ll share soon. I need to get your book. By the way, is it in Spanish? Rebecca, I’ll never forget my first chemo day either. I know what you mean about that wild imagination. Bowel issues do become high on your list of importance, that’s for sure. I look forward to that post you mentioned and my book isn’t available in Spanish as far as I know. I should look into that. Thank you for reading and commenting. 1. Tell nurses about any symptomscan may experience no matter how small when they start the infusion. The chemo nurse told me to tell her, but I didn’t want to bother her with this funny feeling in my feet. When she came by, I casually mentioned it. Wow, she got me up immediately as the agents were likely pooling. Boy was she mad at me! Listen to those nurses…they are the best in the hospital. 2. Depending on what you are getting you may receive steroids. Those can make you wakeful. Conversely, you may receive IV Benadryl to mitigate side effects…that can make you very sleepy. Bring a comfy blankie to keep yourself warm. I cannot sleep anywhere, but I would fall asleep there! 3. I have a pharmacist friend who told me that chemo orders are among the most complex. They expect side effects and have all kinds of drugs ordered up in case they happen. Those nurses watch patients get infused many more times and for longer than the doctors. They really take good care of us! Tracey, Great tips. Thank you. Why do we so often feel like we don’t want to bother the nurses? Craziness. It’s kind of our ‘job’ to do that when you think about it. And I totally agree about the chemo nurses, although I did have one that totally irritated me, but that was a personality conflict thing. They most certainly do see it all and take wonderful care of us indeed. Thanks again for sharing. Becky, I like your approach about curiosity/exploration, but I don’t think it would have worked for me. My fear would have ‘busted’ right through that. Totally agree about the food. Someone did warn me about not eating my favorite foods on infusion day as they might never again be favorites. Thanks for sharing the link to your tips. I’ll have to do a separate post for that sometime. My intent for this post was to prepare for that first day emotionally/mentally on what to expect, but all these tips from everyone are just wonderful. Thanks for yours. my husband had cancer and he had to have a pic-line. That’s what I thought a port would be. So I had first chemo into the vein in my arm. It’s easy to tell which arm; the one with the burned vein showing through the skin. The second chemo came AFTER I had the port put in. Get a port! I also felt wonderful on the Thursday and Friday I had infusions. The bottom didn’t fall out until Saturday evening. Then I found that couldn’t hold my cell phone to my ear. I was exhausted! This kind of tired can not be fixed with a good nights sleep. I had infusions on Thursday and Friday three weeks apart. I missed a total of 12 days from my part-time teaching job. My students learned more than physics that semester. Cindy, I agree about the port. I freaked out when I learned I had to have one, but I was really glad I had it. Sorry about your burned vein. Ouch. I felt pretty good for a day or two as well, the steroids I guess. Then after that, the bottom dropped out for me too. Talk about mood swings. Pretty intense. And fatigue. And sleep issues. Well, you understand all too well. Your students definitely learned more than physics that semester. Cancer has a bigger than we realize ripple effect. Thank you for sharing. And I’m sorry your husband had cancer too. Thank you for this. I am about to embark on my chemo journey. Some days I feel mentally prepared, others I don’t. I am currently obsessing with a need to buy hats, whilst my family sing from the sidelines ‘get a wig’ lol. Funny how the smallest of things can be irritating despite understanding it is their way of trying to relate and support, and knowing that losing hair would be their worst nightmare in their individual minds makes it no easier to be patient. Right now the wig just isn’t important to me. I’m bad I know, maybe I’m unappreciative, that I don’t know, but I have so many other things to organise in my mind, hats will be fine. An idea of how the chemo process might roll is really helpful and something I needed to consider, so thank you thank you thank you. Jay, I’m glad this post was timely and helpful for you. You might wish to read the entire book. Good luck with your chemo and thank you for the feedback. Getting Past the Fear, An Update & a Giveaway too!